Our research has not yielded any clear indication that the confusion doctrine is a recognized exclusionary rule or defense to a license suspension in Florida. And though we might agree that the confusion doctrine could properly be applied in circumstances where law enforcement created a defendant’s confusion about the right to counsel for breath testing, the cases before us do not present those circumstances. Here, the undisputed facts show that the defendants’ confusion was not officer-induced. The arresting officers did not advise the defendants of their Miranda rights before or during their reading of the implied consent law. As discussed above, our implied consent statute does not obligate a police officer to advise an accused that the right to counsel does not apply to the breath test setting. However, we see no harm in placing a minimal burden on officers to briefly explain this to suspects who request counsel when asked to submit to a breath test. Such an explanation would clear up a suspect’s confusion and ensure that refusals admitted into evidence at trial are, in fact, knowing and voluntary refusals that show “consciousness of guilt.” We believe that responsible police practice “should lead professional, courteous officers to advise insistent defendants that the right to counsel does not apply to chemical tests. Where a driver repeatedly asks to speak with an attorney, it would be courteous and simple for the officer to correct the accused’s mistaken assumptions.” Reitter, 595 N.W.2d at 655. Of course, we cannot impose duties beyond those created by the legislature. The implied consent statute was enacted to assist in the prosecution of drunk drivers. Determining whether informing a suspect that he does not have the right to a n attorney for breath testing purposes—as part of the implied consent warning—supports or frustrates the goal of gathering evidence for these cases is a matter for the legislature to decide. Prejudgment interest may be awarded where the plaintiff suffers an out-of-pocket pecuniary loss and establishes a fixed date of the loss...Damages are liquidated 'when a verdict has the effect of fixing damages as of a prior date. '...Future damages, such as “anticipated business profits,” are not vested property rights and cannot be liquidated as of a past date certain. We also note that we may not consider appellant’s arguments regarding the attorneys’ fee hearing. This court may review only proceedings occurring prior to the date of appellant’s notice of appeal. Fla. R. App. P. 9.110(h). As the notice of appeal was filed months prior to the hearing on attorneys’ fees, we lack jurisdiction to consider the issue. Are punitive damages of $5,000,000 arbitrary or excessive under the Federal Constitution where the jury awarded no compensation beyond presumed nominal damages but found that defendant intentionally and maliciously harmed plaintiff by slanders per se? The jury found the hospital liable on the breach of contract claim and fixed his total damages at $2,817,000, reduced to $1,517,000 because he could have mitigated his losses. In separate proceedings on the slander per se claim, the jury found Lawnwood liable for the slanders; that Lawnwood specifically intended to harm him by its per se slanderous statements; that, in fact, it had actually injured him by the statements; and that he suffered no compensatory damages from the slanders but that he was entitled to punitive damages of $5 million from the hospital. After extensive hearings, the trial court denied Lawnwood’s post trial motions for directed verdict and a new trial or a remittitur of punitive damages to a reduced sum. In the appeal of the contract claim, Lawnwood repeats its trial court argument of statutory immunity from liability to the surgeon. As to the claim of slander per se, Lawnwood presents no appellate issues regarding liability or entitlement to punitive damages. Instead it appeals solely the amount of punitive damages, confining its argument to the contention that $5,000,000 is excessive under the United States Constitution. Before addressing these two issues, we must first examine the evidence supporting the verdicts. The court then provided an extensive analysis of punitive damage caps and the application of the specific case at issue. Nevertheless, it is clear that the State provided Ms. Cronin with a payment of $500, which is a significant sum to an admitted crack cocaine addict and prostitute. Ms. Cronin was the key witness in this case, and the credibility of her testimony was critical to the State’s case against Petitioner. The $500 payment would have provided substantial and specific evidence of Ms. Cronin’s motivation to lie against Petitioner. The $500 payment was more than just another avenue of impeachment against an already discredited witness. The fact that the lead detective and the lead witness twice denied the existence of the payment is at least a tacit admission that it was perceived to have relevance to a reasonable fact finder viewing the credibility of this witness. More importantly though, neither the trial court on remand nor, therefore, the Supreme Court of Florida on review, addressed the impact of the inability to impeach Detective Sylvester concerning her denial that any payment had been provided to Ms. Cronin. Petitioner’s counsel was never given the opportunity to impeach the detective concerning her false testimony with regard to the payment, or to impeach her regarding her having permitted the key witness to give false testimony under oath before the court in the trial proceeding. Certainly a reasonable, objective fact-finder would have considered such testimony relevant to the evaluation of the evidence. The $500 payment would have been of special concern to the fact-finder since Ms. Cronin had previously and repeatedly denied any knowledge of the circumstances surrounding the murder. Under the facts of this case and the applicable federal law, Petitioner has shown that the decision of the Supreme Court of Florida was contrary to, or involved an unreasonable application of, clearly established Federal law, as determined by the Supreme Court of the United States. Likewise, Petitioner has shown that the decision of the Supreme Court of Florida was based on an unreasonable determination of the facts in light of the evidence presented. For this reason, this issue is meritorious, and Petitioner is entitled to habeas relief on this claim. "Fla. House passes limits on lawsuits, lawyer fees"
Business Week has an article today titled "Fla. House passes limits on lawsuits, lawyer fees." The article can be viewed HERE. You can also read articles in the Tampa Tribune and Miami Herald. Update: On June 9, 2011, the Florida Supreme Court reversed the underlying opinion in this case. The Florida Supreme Court's opinion can be viewed HERE. The Third District misapprehended the significant differences between Delaware’s and Florida’s indemnification statutes. Florida’s Legislature, as a matter of public policy, enacted an indemnification statute that prohibits a corporate officer from seeking indemnification if the officer knowingly violated the law or entered into a transaction for an improper personal benefit. Section 607.0850(7), Fla. Stat. There is no such similar prohibition in Delaware law. To the contrary, Delaware’s statute mandates indemnification even in cases where the Florida Legislature (as evidenced by its specific adoption of subsection (7)) has determined such an indemnification obligation would be offensive both to the public interest and the legitimate business community. The Third District disregarded Florida law, and instead imposed Delaware’s indemnification law on BIV-Miami, a foreign corporation merely doing business in Florida. Ignoring Florida law to blindly follow Delaware law is not reasoned judicial decision-making. See Stuart R. Cohn, Dover Judicata: How Much Should Florida Courts Be Influenced By Delaware Corporate Law Decisions?, 83 Fla. Bar J. 20, 21 (Apr. 2009) (“The prominence of Delaware courts should not . . . lead to an overly submissive attitude or one that gives undue influence to Delaware decisions . . . [T]here are considerable differences between Florida and Delaware that ought to provide caution to Florida courts.”). This issue is one of critical public importance for all corporations doing business in Florida. Corporations should be able to depend on the Legislature’s considered judgment that no corporation doing business in Florida should be forced to indemnify and pay for the criminal acts of a wayward corporate officer. The Third District also created a direct and express conflict by allowing the trial court to resolve the quintessential jury question of which reasonable interpretation of de Saad’s employment contract was more reasonable, simply rejecting BIV’s understanding that it could suspend her until there was clarification as to whether she engaged in wrongdoing. 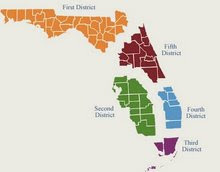 The Third District created additional direct and express conflicts with Florida law governing whether factual disputes (such as to who breached first) can be resolved on summary judgment, whether the doctrine of mitigation exists in Florida contract law, and whether summary judgment can be granted when a party has well-pled unresolved affirmative defenses. These issues are of great importance to all parties who contract for goods or services in Florida. In a split 4-to-3 vote, the Supreme Court of Georgia has upheld the state's emergency room statute as constitutional. Passed as part of the General Assembly‟s 2005 “tort reform” legislation, the ER Statute states that certain emergency health care providers cannot be held liable unless there is “clear and convincing evidence” they were grossly negligent. In today's opinion, written by Presiding Justice George Carley, the majority finds that the statute is a “general law,” as opposed to a “special law,” and therefore passes constitutional muster. The Georgia Constitution prohibits special laws that are not applied uniformly throughout the state and when general laws on the same issue already exist. The constitutional challenge of the statute stems from a lawsuit filed in Muscogee County by Carol and Robert Gliemmo. According to briefs filed in the case, the night of April 22, 2007, Carol Gliemmo felt a sudden “snapping in her head.” Her husband called an ambulance, which took her to St. Francis Hospital in Columbus where Dr. Mark Cousineau treated her in the emergency room. Cousineau diagnosed Gliemmo with “hypertensive urgency,” or greatly increased blood pressure. The Gliemmos later claimed the physician blamed her headache on “stress” and high blood pressure, prescribed Valium and sent her home. The hospital and physician claimed they gave her a beta-blocker to treat the high blood pressure and performed an EKG and blood tests. After her blood pressure went down and she told nurses she felt “much better,” they released her. Two days later, her family practitioner ordered a CT scan, which revealed a brain hemorrhage that left her paralyzed. Gliemmo and her husband sued Cousineau, St. Francis and the physician's employer, alleging professional negligence for failing to order a CT scan that would have detected her brain aneurysm. The defendants filed a motion to dismiss the case on the ground that the Gliemmos failed to establish that the emergency medical providers had been “grossly negligent,” and therefore they were not liable under Official Code of Georgia § 51-1-29.5 (c) – the state's ER Statute. In response, the Gliemmos challenged the ER Statute as unconstitutional, arguing the statute is a special law because it gives special liability exemption to emergency medical care providers, despite general laws governing negligence claims that apply to all other health care professionals. The trial court judge rejected their challenge but asked for the state Supreme Court‟s guidance before proceeding to trial. The majority points out the General Assembly passed the legislation in response to the growing difficulty in finding and affording medical malpractice insurance. “Promoting affordable liability insurance for health care providers and hospitals, and thereby promoting the availability of quality health care services, are certainly legitimate legislative purposes,” the majority opinion states. “Furthermore, it is entirely logical to assume that emergency medical care provided in hospital emergency rooms is different from medical care provided in other settings, and that establishing a standard of care and a burden of proof that reduces the potential liability of the providers of such care will help achieve those legitimate legislative goals.” Joining the majority are Justices P. Harris Hines, Harold Melton and David Nahmias. Gliemmo Et Al. v. Cousineau Et Al. The Court finds that counsel’s conduct was willful and not merely negligent. It demonstrates bad faith on her part. As an attorney, she is deemed to have known better. She owed a duty to follow the rules and to respect the Court. Counsel’s pattern of conduct conclusively establishes that she did not mistakenly violate a provision of law. She knowingly violated Rule 11. Her response to the Court’s show cause order is breathtaking in its arrogance and borders on delusional. 7. DEFAULT – In the event buyer cancels or otherwise does not adhere to the overall terms of the sales contract, Revolving Charge Agreement, Credit Card Agreement, buyer forfeits to seller any deposit, or payment amount as liquidated damages to be used for ordering, restocking, storage, financing and administrative expenses associated with the original sales contract. In addition buyer agrees that seller’s retention of these amounts shall be in addition to any other remedy to which seller is otherwise entitled, pursuant to the default provision of the Revolving Charge Agreement o[r] Credit card agreement. Legal venue for all disputes shall be Palm Beach County. Unless a separate written Revolving Charge Agreement or Credit Card agreement exists full payment for the sales contract is due and payable upon receipt of the merchandise, SELLER reserves the right to levy 1.5% interest per month, 19.56 Annual Percentage Rate, on any outstanding balances past due and unpaid by buyer. SELLER shall also be entitled to recover from buyer attorney’s fees and costs incurred in the enforcement of the terms of this agreement. The Third District concluded that, based upon the language of the entire provision, the venue language only related to disputes arising from a default. "See Sauder v. Rayman, 800 So. 2d 355, 358 (Fla. 4th DCA 2001) (in interpreting forum selection clause, Court looked to the intent of the parties and the language used in the particular forum provision)." In Fernandez v. Haber & Ganguzza, LLP (3D08-3195), the Third District held that "Although we do not agree with the actions taken by the Ganguzza law firm, we affirm because as a matter of law, the law firm is entitled to litigation immunity as to Fernandez’s tortious interference claim arising from the filing of the lis pendens in conjunction with pending litigation relating to the subject unit." On appeal, Fernandez contends that the trial court improperly determined that absolute immunity applied and that there was sufficient record evidence of malice to overcome summary dismissal, though malice is not an element of proof to assert tortious interference. Although we believe that Ganguzza and his firm abused the legal process, we do not agree with Fernandez’s position. In Echevarria, McCalla, Raymer, Barrett & Frappier v. Cole, 950 So. 2d 380 (Fla. 2007), the Florida Supreme Court held that absolute immunity applies to any act occurring during the course of a judicial proceeding, whether the underlying claim constitutes a common law tort or a statutory violation, including tortious interference with a business relationship, so long as the act has some relation to the proceeding. See also Boca Investors Group, Inc. v. Potash, 835 So. 2d 273 (Fla. 3d DCA 2002). In the case before us, it is undisputed that the lis pendens filed by Ganguzza’s firm was filed during the course of the judicial proceeding brought by the Association against Fernandez. There was undisputed evidence in the record that the law firm was directed by the Association to prevent the sale, thus the firm was privileged in placing the lis pendens in connection with the action for injunctive relief. Any proceeding based on statements made in connection with a judicial proceeding are not actionable. C-SPAN posted Chief Justice Roberts remarks at the University of Alabama Law School [see HERE]. C-SPAN's description of the remarks, given March 9, 2010, are below and the video is directly below the remarks. Supreme Court Chief Justice John Roberts addressed students at the University of Alabama Law School about the history of the U.S. Supreme Court. Following his remarks he responded to questions from audience members. In response to a student, Justice Roberts said the Senate's confirmation process for federal judges is "broken down" and stated that President Obama's State of the Union speech degenerated "into a political pep rally." Former University of South Florida head football coach Jim Leavitt filed a 53 page complaint, 120 pages with exhibits, against USF for breach of contract, access to public records, declaratory relief and injunctive relief. The complaint, HERE, was filed in Hillsborough County, Florida Circuit Court. Interestingly, the 21 page head coaching contract at issue is attached to the complaint. Leavitt is seeking more than $7 million and claims he was improperly terminated after the univesity claimed to terminate him for hitting a student athlete. Articles can be found at the Tampa Tribune (who posted the complaint); ESPN; the Orlando Sentinel; and My Fox Tampa Bay. The plaintiffs, David Corbitt and Alexander Raya (collectively, “Appellants”), appeal the entry of summary judgment in favor of the defendant, Home Depot U.S.A., Inc. (“Home Depot”), on their sexual harassment and retaliation claims under Title VII of the Civil Rights Act of 1964, 42 U.S.C. §§ 2000e–2000e-17, and their state law claims of assault and battery, outrage, and invasion of privacy. This action arose from the Appellants’ employment with and termination from Home Depot. The Appellants asserted claims of sexual harassment and retaliation in violation of Title VII, claiming that Home Depot’s regional human resources manager, Leonard Cavaluzzi, sexually harassed them and subjected them to a hostile work environment from approximately March of 2005 until mid-November of 2005, and that they were terminated on December 13, 2005 in retaliation for reporting the alleged sexual harassment. Home Depot denied their sexual harassment claim and stated that even if the alleged conduct occurred, the allegations did not rise to the level of sexual harassment under Title VII and did not constitute the intentional torts of assault and battery, outrage, or invasion of privacy. According to Home Depot, the Appellants were lawfully terminated for repeated violations of Home Depot’s policies. Both now vacated decisions were 2-1, with Middle District of Florida Judge Patricia C. Fawsett dissenting. The Special Master’s Report and Recommendation is very serious. For reasons stated in this Order, I have a solemn duty to “preserve the integrity of this Court” and to “notify the proper authorities” in accordance with the Federal Judicial Code of Conduct because I conclude that a crime has been, or may have been, committed in connection with a matter over which I preside. See Code of Conduct for the United States Judges, Compendium Section § 1.1(c) (2009); cf. Brookings v. Clunk, 389 F.3d 614, 623 (6th Cir. 2004) (“Additionally . . . Judge Clunk had an obligation to report potentially obstructive conduct to the proper authorities if he felt such conduct had occurred in a case before him.”). While I understand Defendants’ concerns regarding a referral to the appropriate authorities, I cannot stand idly by as revelations of seemingly criminal activity continue to amass. In referring this matter to the authorities, I acknowledge and affirm that I am not a prosecutor. As such, the reference will be made in a neutral fashion, carefully calculated to avoid passing judgment on the culpability of the persons involved. However, to the extent that my silence can be construed as indifference to the allegations of criminal activity that have effectively engulfed this case, I remain silent no longer. In January 2005, a Florida court granted final judgment of foreclosure to Potter against Gary and Yolanda Parker....On February 1, 2006, Parker filed suit against Potter and Money Consultants in the District Court, seeking a restraining order to prevent the sale of the property. DE 1. The District Court dismissed the action with prejudice, Parker v. Potter, No. 8:06-CV-183-T-26EAJ, 2006 WL 1529546 (M.D. Fla. May 24, 2006) (not reported in F. Supp.) (“Parker I”), but this Court vacated and remanded the decision to afford Parker the opportunity to amend her complaint and proceed with an action for rescission under TILA and certain state law fraud claims. Parker v. Potter, 232 F. App’x 861 (11th Cir. 2007) (unpublished) (“Parker II”). Potter avers that the Rooker-Feldman doctrine barred the District Court from reaching a decision on Parker’s claim for rescission. Noting that a Florida court entered final judgment for foreclosure against Parker before she filed her claim for a rescission under TILA in federal court, Potter alleges that the District Court lacked jurisdiction to review, reverse, or invalidate that final state court decision. In certain circumstances, a federal court must decline or postpone the exercise of its jurisdiction by deferring to the courts of the several states. The doctrine established by the Rooker and Feldman cases essentially holds that federal courts – other than the Supreme Court – do not have subject matter jurisdiction over “cases brought by state-court losers [(1)] complaining of injuries caused by state court judgments rendered before the [federal] district court proceedings commenced and [(2)] inviting district court review and rejection of those judgments.” Exxon Mobil Corp. v. Saudi Basic Indus. Corp., 544 U.S. 280, 284 (2005). The Rooker-Feldman doctrine barred the District Court from hearing Parker’s claim for rescission under TILA. The same parties in this action participated in the subject state proceeding, and a Florida court granted a final judgment for foreclosure in favor of Potter against Parker. *conduct refined searches within the results of a previous search. Thanks to the BC Law Library. Because Huppman did not provide a corroborating affidavit by a qualified medical expert in compliance with section 766.203(2), Florida Statutes (2007), the circuit court departed from the essential requirements of the law in denying Vein Center's motion to dismiss. In June 2008, Huppman served her notice of intent to initiate litigation ("NOI") pursuant to section 766.203(2).1 In the NOI, Huppman alleged that she was injured after undergoing a treatment known as Lumenis One, which involved the use of intense pulsed light ("IPL") equipment to improve the appearance of age spots on her body. Huppman did not serve a corroborating medical expert opinion with the NOI as required by section 766.203 because Huppman believed Vein Center had waived its right to medical corroboration by failing to provide Huppman with medical records. Huppman subsequently filed a complaint alleging medical negligence against Vein Center. Vein Center filed a motion to dismiss in which it argued, among other things, that the complaint should be dismissed based on Huppman's failure to attach a medical expert opinion to the NOI. In response, Huppman maintained that Vein Center waived the medical expert opinion requirement by failing to produce requested medical records. However, Huppman also served Vein Center with the affidavit of Terri Boyert as a corroborating medical expert opinion. Vein Center then filed the petition for writ of certiorari that is currently before this court. Vein Center argues that the circuit court departed from the essential requirements of the law in failing to dismiss the complaint based on Huppman's failure to provide a corroborating affidavit by a qualified medical expert in compliance with section 766.203(2). Preliminarily, we note that "the courts of this state have uniformly recognized the availability of certiorari review in cases where the presuit notice requirements of chapter 766 have not been met." Oken v. Williams, 23 So. 3d 140, 144 (Fla. 1st DCA 2009). We review the sufficiency of the corroborating affidavit in order to comply with our duty to enforce the policy behind the presuit notice requirements. Id. at 145. Thus, under sections 766.203(2), 766.202(6), and 766.102(5), the written expert opinion that accompanies a claimant's notice of intent must be rendered by a person who (1) is "duly and regularly engaged in the practice of his or her profession," (2) has a degree in health care from a college or university, (3) is a licensed health care provider, and (4) satisfies the expert witness requirements set forth in section 766.102(5). Boyert's CV does not reflect, nor has Huppman ever asserted, that Boyert has a degree in health care from a college or university. Boyert's CV contains only these vague references to any college education: "Surgical Assistant, TCC College, Tacoma, Washington, 1987" and training at the Eton Medical Institute. Additionally, Boyert's CV does not reflect that Boyert is a licensed health care provider, and Huppman has conceded that Boyert is not licensed. Because Boyert does not meet these two requirements, she is not qualified to render a medical expert opinion under section 766.203(2) regardless of whether she meets the additional requirements of section 766.102(5). Although Boyert may be adequately trained regarding the manner and method in which the Lumenis IPL equipment was operated based on her experience training staff on the operation of the machine, we disagree with the circuit court's conclusion that she meets the statutory criteria of a presuit witness under chapter 766...The legislature has clearly indicated its intent to narrow the class of person who is qualified to give medical expert opinions by amending the statutory scheme in 2003. As an alternative argument against granting certiorari in this case, Huppman claims that she has cured any defect in her medical expert opinion by submitting a second affidavit by Dr. Wayne Houston. The Vein Center responds that the affidavit was not timely filed within the applicable statute of limitations and, in fact, was filed after the circuit court entered the order that is now before this court. If this affidavit was submitted within the applicable statute of limitations, it may indeed comply with the presuit notice requirements. However, Dr. Houston's affidavit was not considered by the circuit court, and it would be improper for this court to consider it for the first time on appeal. [t]he charging lien is an equitable right to have costs and fees due an attorney for services in the suit secured to him in the judgment or recovery in that particular suit. It is not enough to support the imposition of a charging lien that an attorney has provided his services; the services must, in addition, produce a positive judgment or settlement for the client, since the lien will attach only to the tangible fruits of the services. An essential prerequisite to imposition of a charging lien is that the underlying litigation produces a positive judgment or settlement – in other words, some “tangible fruits of the attorney’s service” for the benefit of the client...If the litigation produces no judgment of monetary value for the client, the court may not impose a charging lien for the attorney’s benefit. Because a judgment had not been entered, the charging lien was not proper. The hospital also contends that the trial court departed from the essential requirements of the law in ordering production without balancing the interests....We conclude that Defendants sufficiently explained below why they needed the information: in order to dispute, as unreasonable, the amount of medical expenses that the plaintiff will seek to recover from them, if the hospital charges non-litigation patients a lower fee for the same medical services. A claimant for damages for bodily injuries has the burden of proving the reasonableness of his or her medical expenses.....The trial court’s findings, while brief, sufficed for this purpose. However, the trial court also must take such protective measures as are required. § 90.506, Fla. Stat. As Defendants assert, a hospital’s cost to provide a service no longer bears much relationship to what it charges, but reimbursement rates from third party payors give hospitals an incentive to set their usual charges at an artificially high amount, from which discounts are negotiated; cost-shifting results in discriminatorily high charges to uninsured patients, in that every patient is billed at full charges, but only the uninsured are expected to pay those amounts; as a result, actual charges are not instructive on what is reasonable; instead, Defendants argue, a realistic amount is what hospitals are willing to accept. In PMG Collins, LLC v. R and G Enterprises, LLC (3D09-3171), the Third District reversed a decision disqualifying counsel for one of the parties "on the grounds that the law firm had previously personally represented one of the principals of the plaintiff LLC in unrelated matters." The court stated "Without exploring any other infirmity in the order, the simple, acknowledged fact that counsel did not represent the plaintiff itself and thus cannot be in forbidden conflict with its interests renders the order completely unsupportable." In a civil case, a change of venue becomes effective when the applicable costs and service charges are paid, and the transferee court receives the court file. § 47.191, Fla. Stat. (2008); Vasilinda v. Lozano, 631 So. 2d 1082, 1087 (Fla. 1994). Once the fees are paid and the file is received, the transferee court assumes jurisdiction. The transferor court is without jurisdiction to take any further action in the case. the law is well-established that a state cannot require a national bank to register or file as a “foreign corporation” in order to maintain a lawsuit in state court. In view of these holdings and the plain language of 12 U.S.C. § 24, Subdivision Fourth, we find that section 607.1502(1) is expressly preempted as applied to all national banking associations. Second, the court rejected the debtor's argument "that conflicts as to the monies owed the bank contained in the bank’s verified complaint, loan statements and affidavits filed in support of its motion for summary judgment create a genuine issue of material fact....At no time have the borrowers offered a contrary calculation of the monies owed; they merely contend, by way of an affidavit in opposition to the bank’s motion for summary judgment, that they do not owe the amounts alleged by the bank. Such conclusory assertions are insufficient counter-evidence to avoid summary judgment." In Keesler et al. v. Community Maritime Park Associates, Inc. (1D09-1659), the First District held "that section 286.011(1), Florida Statutes (the Sunshine Law), gives Appellants the right to be present but not to speak at CMPA meetings." Articles can be found in the Tallahassee Democrat, Miami Herald and the Pensacola News Journal. The Commission’s order denied Petitioners’ request to treat certain employee compensation information as confidential and exempt from public disclosure under Florida’s Public Records Law. Florida Power & Light Company (Florida Power) also petitions for a writ of certiorari to quash a similar order entered by the Commission regarding its employees’ compensation information. Florida Power’s employees petition for a writ of mandamus to prevent the disclosure of their compensation information, arguing such disclosure would violate their right to privacy guaranteed by Article I, section 23 of the Florida Constitution. Progress Energy and Florida Power included employee compensation as costs associated with the increased rate change. Information relating to the rates or costs of services is relevant in a ratemaking proceeding for discovery purposes. § 366.093(2), Fla. Stat. Discovery in a ratemaking proceeding is governed by Florida Rule of Civil Procedure 1.280. See id. the Commission’s staff issued a series of interrogatories requesting the following information for all Progress Energy and Florida Power employees who earned $165,000 or more per year: name and title; base salary; overtime; bonuses; stock options; option awards; non-equity incentive plan compensation; all other compensation; total compensation; amount of total compensation allocated to the utility; and amount of total compensation included in adjusted jurisdictional other operation and management expenses. The Commission denied Progress Energy’s and Florida Power’s confidentiality requests after construing sub-subsection (f) to expressly exclude compensation information from the definition of proprietary confidential business information. The Commission found the statute was unambiguous, but went on to find that even if the statute were ambiguous, the specific provisions of sub-subsection (f) prevailed over the general definition in subsection (3). As explained below, the Commission’s interpretation of section 366.093(3)(f) is clearly erroneous; therefore, we must depart from the Commission’s construction. See PW Ventures, Inc. v. Nichols, 533 So. 2d 281, 283 (Fla. 1988) (explaining the Commission’s construction of statute it is charged with enforcing is entitled to great deference and the court will not depart from such construction unless clearly erroneous). Congress enacted the Bankruptcy Abuse Prevention and Consumer Protection Act of 2005 (BAPCPA or Act) to correct perceived abuses of the bankruptcy system. Among the reform measures the Act implemented are anumber of provisions that regulate the conduct of “debt relief agenc[ies]”—i.e., professionals who provide bankruptcy assistance to consumer debtors. See 11 U. S. C. §§101(3), (12A). These consolidated cases present the threshold question whether attorneys are debt relief agencies when they provide qualifying services. Because we agree with the Court of Appeals that they are, we must also consider whether the Act’s provisions governing debt relief agencies’ advice to clients, §526(a)(4), and requiring them to make certain disclosures in their advertisements, §§528(a) and (b)(2), violate the First Amendment rights of attorneys. Concluding that the Court of Appeals construed §526(a)(4) too expansively, we reverse its judgment that the provision is unconstitutionally overbroad. Like the Court of Appeals, we uphold §528’s disclosure requirements as applied in these consolidated cases. Articles can be found at the following links: Reuters; Wall Street Journal Law Blog; and the New York Times. "Fla. Insurance Case Could Set Precedent for Hurricane Claims"
(1) Does Florida law recognize a claim for breach of the implied warranty of good faith and fair dealing by an insured against its insurer based on the insurer’s failure to investigate and assess the insured’s claim within a reasonable period of time? (2) If Florida law recognizes a claim for breach of the implied warranty of good faith and fair dealing based on an insurer’s failure to investigate and assess its insured’s claim within a reasonable period of time, is the good faith and fair dealing claim subject to the same bifurcation requirement applicable to a bad faith claim under Fla. Stat. § 624.155? (3) May an insured bring a claim against an insurer for failure to comply with the language and type-size requirements established by Fla. Stat. § 627.701(4)(a)? (4) Does an insurer’s failure to comply with the language and type-size requirements established by Fla. Stat. § 627.701(4)(a) render a noncompliant hurricane deductible provision in an insurance policy void and unenforceable? (5) Does language in an insurance policy mandating payment of benefits upon “entry of a final judgment” require an insurer to pay its insured upon entry of judgment at the trial level? Having reviewed the record in this case, including prior proceedings, we reverse the summary denial of Johnston's newly discovered evidence claim relating to mental retardation and temporarily relinquish jurisdiction to the circuit court for thirty days for an evidentiary hearing to be held on the issue of whether newly discovered evidence indicates that Johnston is mentally retarded pursuant to Atkins v. Virginia, 536 U.S. 304 (2002), section 921.137, Florida Statutes (2009), and Cherry v. State, 959 So. 2d 702 (Fla. 2007). The Court reserves ruling on the issues raised in this appeal until jurisdiction returns to this Court after the relinquishment. Baker County Medical Services, Inc. (BCMS), appeals a final judgment interpreting section 641.513(5)(b), Florida Statutes (2006). BCMS raises two issues on appeal. First, BCMS argues that the trial court erred in ruling that the term “provider” in section 641.513(5)(b) is not limited to any specific type of provider. We disagree and affirm on the first issue. Second, BCMS argues that the trial court erred in ruling that the phrase “usual and customary provider charges” in section 641.513(5)(b) includes consideration of the amounts billed by providers, as well as the amounts accepted by providers as payment. We agree in part and reverse with directions on the second issue. BCMS asserts that the “usual and customary charges” include only the amounts billed or the charge master rates. The term “charges” is not defined in section 641.513(5). When a statute does not define a term, we rely on the dictionary to determine the definition. See Green v. State, 604 So. 2d 471, 473 (Fla. 1992). “Charge” is defined as a “[p]rice, cost, or expense.” BLACK’S LAW DICTIONARY 248 (8th ed. 2004). In paragraph (5)(a), the term “charge” is modified by the terms “usual” and “customary.” “Usual” is defined as “[o]rdinary; customary” and “[e]xpected based on previous experience.” Id. at 1579. “Customary” is defined as “[a] record of all of the established legal and quasi-legal practices in a community.” Id. at 413. In the context of the statute, it is clear what is called for is the fair market value of the services provided. Fair market value is the price that a willing buyer will pay and a willing seller will accept in an arm's-length transaction. See United States v. Cartwright, 411 U.S. 546, 551 (1973). *Disclaimer: GrayRobinson, P.A. was involved in this action. The D. C. Charter specifies that legislation enacted by the D. C. Council may be blocked if a sufficient number of voters request a referendum on the issue. D. C. Code §1–204.102. The Council, however, purported in 1979 to exempt from this provision any referendum that would violate the D. C. Human Rights Act. See §§1–1001.16(b)(1)(C), 2–1402.73 (2001–2007). The D. C. Board of Elections, D. C. Superior Court, and D. C. Court of Appeals denied petitioners’ request for a referendum on the grounds that the referendum would violate the Human Rights Act. Articles can be found at the following links: CBS News; Reuters; Washington Post; Business Week; CNN; and Fox News. In Reliance Property Management, Inc. v. Transportation Equipment Specialists, Inc. (3D09-411), the Third District affirmed the decision under review because the appellant did not file an appendix with its initial brief. The court stated "In the absence of the filing of an appendix in support of this appeal under Florida Rule of Appellate Procedure 9.130(a)(3)(A), the order under review is affirmed."